Instead of “Eat, Sleep, Rave, Repeat”, do it the Singapore way. This cheeky tee by homegrown designer label Temasek Clothings embraces the Singlish lover in you (even if you don’t quite understand the colloquial terms). Plus, it’s one of the cooler life mantras out there. This three-piece porcelain set – consisting of two plates and a chopstick rest – beautifully simplifies the iconic Singaporean mascot into gorgeous, sleek pieces that can be used in the kitchen or dotted around the home as artworks. This quirky Strangely Singaporean box set of 18 postcards is unlike anything you’ve ever seen (we promise). Adorable illustrations are printed on the colorful pieces, along with charming Singlish sayings and their explanations. Take, for example, phrases like “Stylo Milo” for chic fashionistas, or “Blur Like Sotong” for the clueless folks. 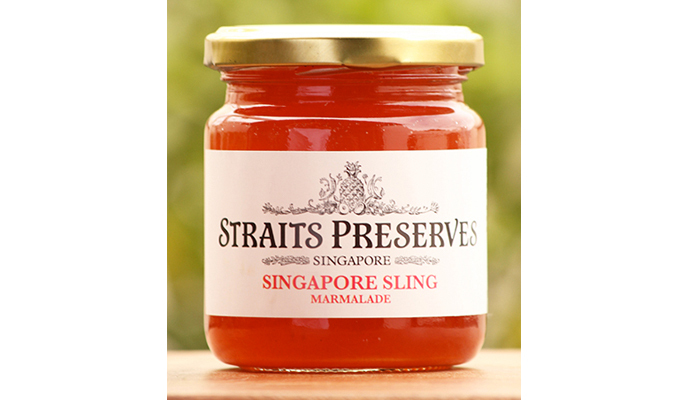 What better way to “preserve” memories of your visit than with this marmalade from Straits Preserves? The spread blends fruity and citrus flavors from ingredients like oranges, pineapples and limes for a tastes of the sunny island’s most famous cocktail. Take your pick from handmade, beeswax-based lip balms with unique scents by local bath and body label, Shophouse Sixty-five. For a midday caffeine fix (sort of), try the Coffeeshop Kopi O. If you want to flaunt your femininity, go for the Rose Bandung; or swipe on some Sentosa Island for a sugary dose of cotton candy. This article originally appeared in the August 2015 issue of Smile magazine.